Many know about the fundraising campaign Movember, in which men are encouraged to grow a moustache and raise money through the month of November to bring funding and awareness to prostate and testicular cancer. 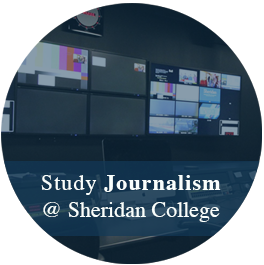 But what may be less known to students is that every year, Sheridan’s student bars, Trafalgar’s Marquee and Davis Campus’s Den, are locked in a friendly competition to raise money. 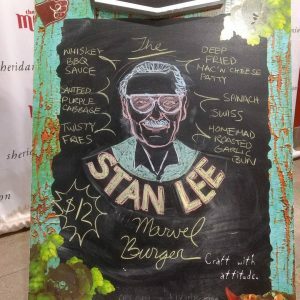 Named in honour of Stan Lee the day after his passing, this burger became especially popular (Photos by Robert Koumarelas). This staff event is managed by Adam Koch, the kitchen manager at Trafalgar Campus branch of the SSU. “We’ve got student staff members creating burgers every day. We are basically pitting the two bars against one another. So, we’ve got the Den and the Marquee, and we’re trying to sell as many burgers as possible between the two,” said Koch. Both are tasked to create a new burger idea every day until the end of November, that is sold for that day only. Each burger meal is $12 and comes with a side of twisty fries, and for every burger sold, $1 is being donated to the Movember Foundation. “They’re all submitted by student staff, so what I did was kind of in mid-October, I had everybody submit their ideas. I gave them a couple of weeks to think about it,” said Koch. 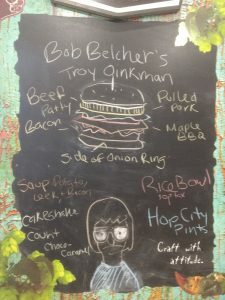 The Bob Belcher’s burger special for today on Nov. 21. Even though not all the burger ideas are popular hits, many have developed a cult following by some customers. One such customer is Scout Stolpmann, a Marquee employee who enjoyed some time off for a bite to eat. Freddie Mercury’s Good Morning: French Toast buns, bacon jam, maple onions, coffee-crusted patty, fried egg, side home fries. The Nietzsche: Beef patty, Beer bratwurst, sauerkraut, horseradish mustard sauce and cheddar. The Fluffy: Pancakes, burger patty, bacon, fried egg, and cheese, drizzled with blueberry maple syrup. “They’re pretty intense, they’re pretty epic. They vary a little bit every day, but they’re usually big and over the top,” said Koch. Stop by the Den or Marquee to help fund cancer research, and get a taste of some Sheridan creativity while it’s still here.